The South America/West Africa direct Ro/Ro-Container maritime service has truly been an innovation on the Atlantic market. It has in fact finally made available to Latin American shippers a fast, reliable and flexible business tool which allows them to open up new destination markets and serve them in a much shorter time. 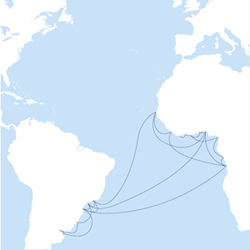 The trade is served by means of all West African destinations scheduled by any of the Group's mainstream services or feeders can be reached via transhipment in Dakar (Senegal) for freight loaded on any of the vessels serving the South America/Northern Europe trade.